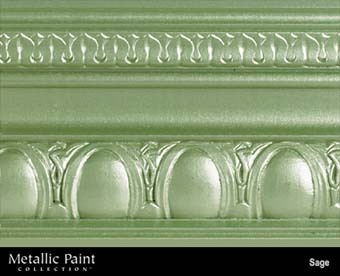 Paint Colors :: MANUFACTURERS :: MODERN MASTERS :: Metallic Paint Collection :: MODERN MASTERS METALLIC PAINT 99822 ME-247 SAGE NT SIZE:6 OZ. MODERN MASTERS METALLIC PAINT 99988 ME-200 PALE GOLD NT SIZE:6 OZ. MODERN MASTERS 99899 PA901 PATINA AGING SOLUTION GREEN SIZE:1 GALLON. XIM 21302 #900 ACRYLIC ALKYD CLEAR SIZE:QUART. RUSTOLEUM 245210 SPRAY SATIN WHITE UNIVERSAL SIZE:12 OZ. SPRAY PACK:6 PCS.